To ring in the spring construction season, Mayor de Blasio previewed City Hall’s street safety priorities in the year ahead. Speaking in Downtown Brooklyn this morning, the mayor stood next to a map of major safety projects planned for 2017. The projects (presumably not an exhaustive list for the year), include several street redesigns that have already been publicly revealed — like Fourth Avenue in Brooklyn, better bike access to the Brooklyn Bridge and Williamsburg Bridge, and Van Duzer Street bike lanes — as well as a few that have not. Notably, it looks like the city will continue its Harlem River bridges initiative with a bike connection on 138th Street linking the Madison Avenue Bridge to Third Avenue in the Bronx. De Blasio noted that to date, the city has relied on $100 million in federal funds for Vision Zero projects, and that the Trump administration’s federal budget outline could slow the pace of street redesigns. In particular, the city is counting on $97 million in federal funds to reconstruct Woodhaven Boulevard with safer walking infrastructure and bus priority treatments. The mayor also said that NYPD continues shift its enforcement practices, with speeding tickets up 17 percent this year compared to 2016, and summonses for failure-to-yield and obstructing a bike lane up 29 and 23 percent, respectively. Each year that de Blasio has been in office, the number of traffic deaths has fallen, but last year, pedestrian and cyclist deaths increased and total traffic fatalities didn’t change much. The city’s speed camera enforcement program has made an impact, but it’s still limited to streets that abut a school entrance during school hours. Transportation Commissioner Polly Trottenberg said that in the past five years, 85 percent of fatalities and injuries happened at times or places where the city is not allowed to operate the cameras under current state law. She’s headed to Albany this evening to meet with representatives about expanding the program beyond the current limit of 140 school zones. “We would like to see some of those restrictions lifted — have the ability to go to more schools and even potentially the ability to look at high crash corridors instead of just schools,” she said. Not a single Queens’ Vision Zero project on that map includes bikes. It’s high time neighborhoods like Downtown Flushing, Elmhurst, Jackson Heights, and Jamaica got protected bike lanes. The money for street improvements is just sitting there waiting to be picked up. Simply charge vehicles by the amount of damage they do to the streets. Heavier vehicles damage the roadway by an order of magnitude more than lighter vehicles ( according to Joe R by the power of 4 ). Interestingly, Broadway in Manhattan has an almost identical street layout as 4th Ave in Brooklyn, except it’s getting the old crappy 4th Ave design, instead of protected bike lanes. I wish the image was higher resolution or at least a link to the source. I would like to read more about some of those projects. Couldn’t find 3 of them, probably new. Queens Blvd is still in progress. Waiting for the DOT to present their Phase III plan to Qns CB 6 this spring. Thanks, don’t know that some of those were up. 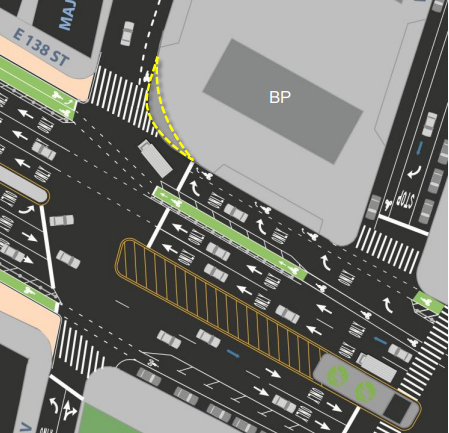 The E 138th St plan has a buffered bike lane between the automotive moving and turning lane (should have just placed it against the curb and let bikes proceed with peds on the upcoming intervale but that damn gas station). Please tell me that there will be some kind of physical separation there, or there will be sideswipes by traffic trying to get onto the northbound Deegan. There has to be flex posts or something. Finally a plan that properly accommodates British cyclists! I make this turn a lot, and I say, yeah, it’s a little unorthodoxed, a little weird, but, let’s try it! Is the DOT proposing to shave off the corner in dotted yellow lines? That’s not needed for cyclists (who can more nimbly turn than autos) and lengthens what’s already a terribly intimidating crossing for pedestrians. I think it’s an extension. Phase two of the Bruckner Blvd greenway? In 2017, will City Hall be more committed to ambitious street redesigns that save lives? An early litmus test will be Fourth Avenue in Brooklyn -- which is ripe for a protected bike lane but is currently in line for much more modest changes from NYC DOT. The bulk of the funds, $317 million over six years, will go toward capital projects that involve full street reconstructions. Those investments are durable and high-stakes -- it's extremely important to get the design right before casting it in concrete.